We had a great show with our friends The Bombadils, in Haverhill at the New Moon Coffeehouse on Sept. 17th & we want to thank all of the lovely people we got to meet there! 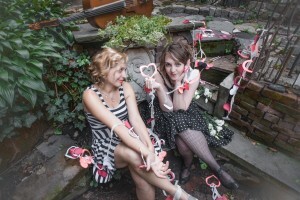 We are joined by Sarah Rabdau & Peter Moore doing a rare duo set and The Ladles a tender/badass/creative trio of fellow NEC musicians that are putting their own stamp on the Boston folk scene. If you haven’t gotten the album (what?) go to http://golimusic.bandcamp.com & remedy the situation. We can’t wait to see you at one of these lovely appearances and make some sounds in your general direction! Thanks for the support and the curiosity! Are you superstitious? Do you hold your breath in tunnels and avoid stepping on cracks in the sidewalk? Whether you’re a skeptic or a believer in the adverse effects of crossing a black cat’s paths, we’ve got a show that will make us all feel lucky right around the corner! We’re so excited that Matt Samolis, the curator of the Advent Library Concert Series (and pretty stellar photographer & musicmaker in his own right), has asked Goli to join our powers with the likes of Moses Buyondo, Veronica Barron, & Dylan McKinstry for the last concert of the season at the Library! Ugandan drummer, Moses Buyondo will start the evening with some ritual drumming (as you do) followed by the storied songs of Veronica Barron. Dylan McKinstry will do a stripped down solo set with masterful guitar and songs & Goli will close out the night, doing what we do! ALL AGES! $10 SUGGESTED DONATION! We do hope you’ll join us for an intimate & exposed night of music! As always, thanks for doing what you do and supporting living art! Spring is coming! Spring is here! Valerie’s walking cast* is almost off! Goli is has two sweet shows coming up to ring in the spring (man it is still chilly out there) and celebrate all things good, like music & being able to walk. 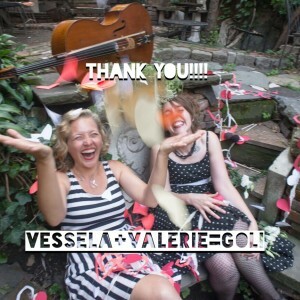 We’ll be joined by our dear friend Petaluma Vale at both our Boston Secret Show and our NYC Caffe Vivaldi show. If you haven’t heard Petaluma Vale (www.petalumavale.com), you should! She is the rad harpist from Jaggery and she’ll be performing her songs with the musical assistance of Valerie on cello & Ali Blake on harp. All Ages! Suggested Donation $10 BYOBeverages & Nibbles to share! IMPORTANT: We’ve only got room for about 50 folks so RSVP your FULL NAME (and any plus 1 if you are bringing one) to GOLIMUSIC at GMAIL.COM to insure your spot! We’ll give you the address to the super cool location! The FB INVITE if that is of interest. Thank you for reading and listening and supporting! *Val broke her foot in mid-January and that has slowed some of the Goli wheels down BUT we think she is getting out of the walking boot in the next week & it will be great!!! Happy Vess-N-Val-Tine’s Day from Goli!!!! We’re pleased as punch that not one BUT TWO tracks from this is not a love song will be featured on the Valentine’s Day Edition of Woody’s Children this Sunday from 4-5pm EST! If you are near Fordham University in the Bronx, you can check it out at 90.7FM. For those of you further flung, you can check it out online at play.wfuv.org. 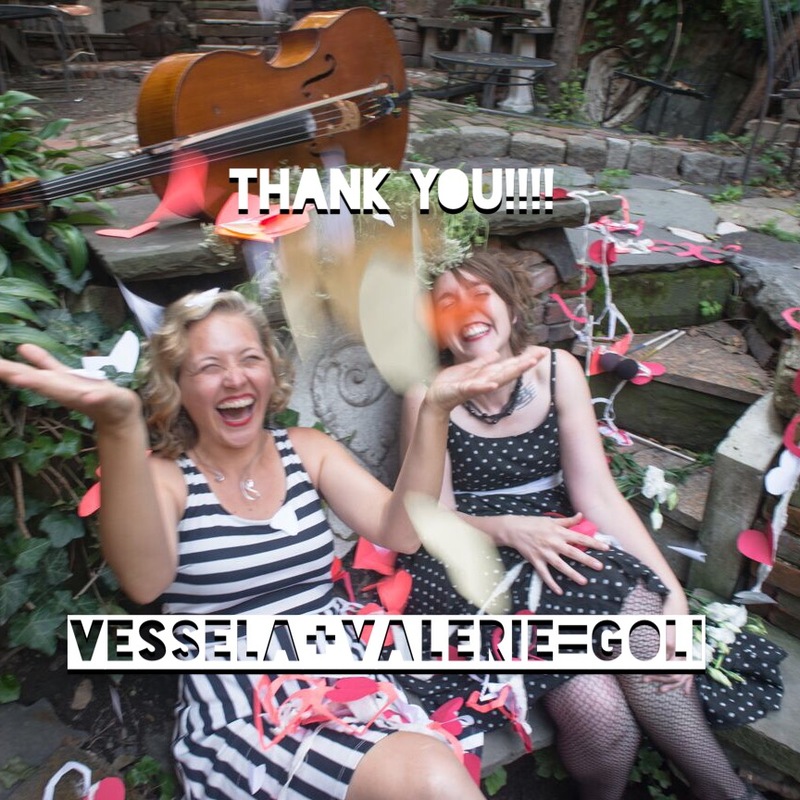 Also, we can’t resist sharing these two Val-n-tine’s greetings from years past so please take a looksee and share the love and spread the silliness with those you’d like to makeout/shake hands with!!! and here is Be Mine! We know that Goli has been hiding away this winter… and we hope to be back at it soon. Val kinda sorta fractured a metatarsal and tore a ligament. So the next time you see Goli, they will be new & improved with TITANIUM!!!! The last time you heard from us we were knee-deep in crowd funding and recording and mixing our new album, this is not a love song. Not in Worcester or NYC and can’t wait to get your hands on the new CD!?!? We’ll be releasing it all over the world (and the interwebs) on Oct. 7th (Valerie’s Bday) so check back in for those links next week! For you rad folks of Massachusetts & Worcester, this is how you are going to get up close and personal with the new release! 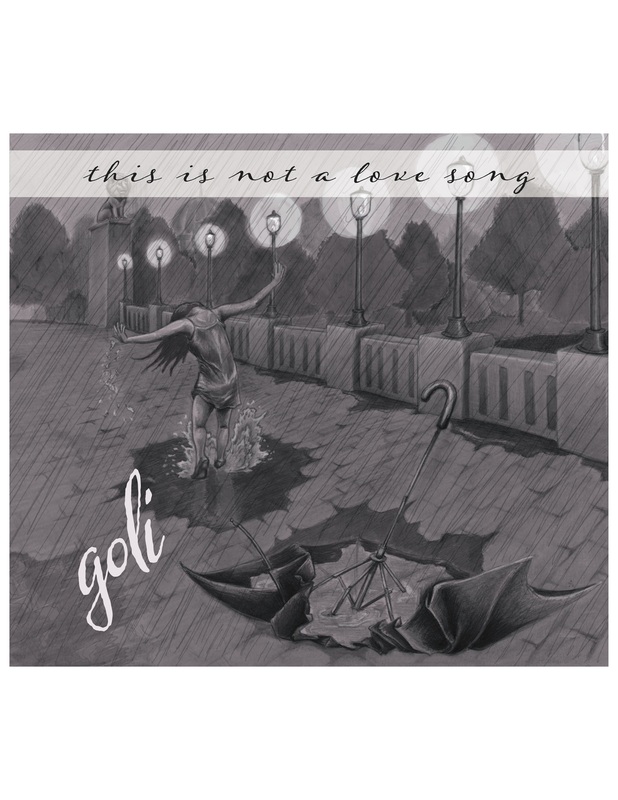 Goli will play some epic sets of music old & new, about love & not about love starting at 9 & going until our fingers fall off! The FB event is here! 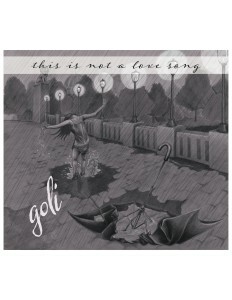 Goli will play two epic sets of music old & new, about love & not about love starting at 9 & wrapping up around 11:30. Both Nick’s & Caffe Vivaldi have been magical and welcoming venues to this little duo that is doing and we can’t wait to celebrate with you at this amazing spaces! For those of you wondering why there isn’t a hometown Boston release happening in October, it’s because we have an evening of epic proportions planned for Dec. 4th. at CAFE 939 Put it in your calendars!!! Jaggery will be on the bill as will up-and-coming band that has stolen our hearts, SkiM and there will probably be one million guest musicians joining us. Just sayin’. This album is a long overdue labor of love. We put our hearts and minds and fingers and hands and voices and brains to it to make this happen and we can’t thank you enough for all of the support you’ve shown us over the years and during our kickstarter campaign. We didn’t make the album alone. Oh no! We had the amazing guidance of co-producer Peter Moore and all of the talents and sounds of a giant, giant posse of some of our favorite musicians.